Gene Wilder, Madeline Kahn, Dom DeLuise and Marty Feldman take on the Sherlock Holmes story. Sherlock wasn't in this movie too often but his younger brother, Sigerson (Gene Wilder) was. The movie opens with Sherlock and Watson discussing a problem given to them by the Queen to solve. National security is at stake. While Sherlock is gone he is gone he passes on some less important cases to his younger brother, Sigerson. Sherlock just pretends to leave but sends Sgt. Orville Stanley Sacker (Marty Felder) to talk to his brother. Sigerson calls his brother "Sheer Luck" Holmes. When Sigerson starts doing the Kangaroo Hop with Jenny Hill and Orville they begins to lose their audience (me). Sigerson tries to help Jenny with the problems she is having. When Sigerson saves the day, Sherlock gets the credit. Sigerson is not so pleased. As the movie goes on it gets worse and worse. poorly written, poorly directed and poorly acted. When someone watching the play breaks the third wall and turns and asks the audience "Is this rotten or wonderfully brave?" you want to scream your answer at him. Rotten! Gene Wilder is a very funny actor when he is working for another director and writer. 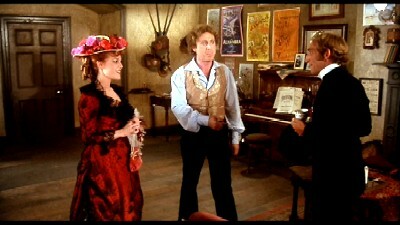 In Mel Brooks hands he was a comic genius (Young Frankenstein, The Producers). in his own hands (Haunted Honeymoon, The Woman in Red, The World's Greatest Lover and Sherlock), he is not so good.